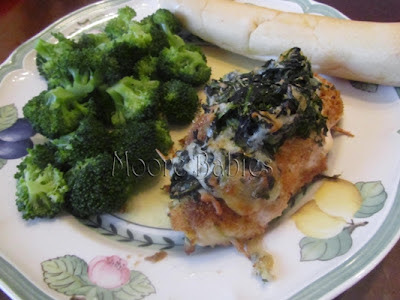 I came across this pin the other day for Spinach & Pepper jack Stuffed Chicken over at Cooking Creation so I decided to add it to my meal plan for the week. The directions said to use 1 tablespoon breadcrumbs and 2 tablespoons Cajun for the crust... but I flipped it because (a) the little ones were going to eat this and (b) it didn't seem like enough bread crumbs and TOO much Cajun. Even with switching up the amounts it was a tad spicy when combined with the pepper jack cheese but we both LOVED this recipe. This will be added to our "approved" recipe rotation! !